As you approach a level crossing you get a red cross icon and a "cheery train whistle" sound. In case you're not quite sure what that may sound like then you can see it in the official video clip after clicking the 'Read More' link below. The POIs are available in .gpi format ready to simply copy and paste onto your nuvi, zumo or any other Garmin device that can accept the files. 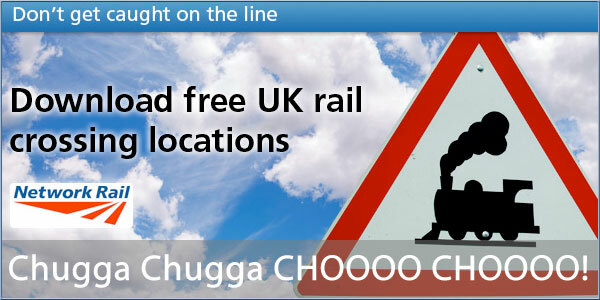 If you don't have a Garmin but you still want to get warnings for level crossings then you can also download our own POIs for level crossings (look under the Transport category) that will work on a wide variety of SatNav's from various manufacturers and is regularly updated/maintained. Ooo, Milford (Surrey) one of the most abused crossings on the Waterloo - Portsmouth mainline. I've witnessed the local idiots carefully usher numerous cars, a lorry, a bus & a school bus around the barriers when they've been stuck down. Be alert.. This country needs more lerts. And of course, on many other systems you can still have the "cheery train whistle" sound as an audible warning. Here's one I just edited up and saved in .ogg format for TomToms. Either put it into the "sounds" folder and select it from the sound effects page when setting up the "Warn when near" of the level crossings POI file you're using, or rename it to match the POI file name to get the TomTom to select the audio automatically (just like with the speed cameras). What would be really useful is if Tomtom and Garmin could hook their live services into Network Rail's train location database, so the satnavs could take you on a crossing-avoiding route if the barriers were going to be down when you got there. Particularly useful if they're planning on sending three trains through in a row, so the barriers stay down for ages. No, that could be classed as a security issue. Live with it. If you don't want to chance having to wait at level crossings find an alternative route. 1: Find out how the user of electric chair feels, when your car goes underneath my train as there's a nominal 750v DC @ 6kA in the 3rd rail. 2: Hopefully if you're lucky you won't know anything about it as I hit your car with between 170 & 510 tonnes of metal at anywhere between 70 & 100mph. 3: Find out if there's a heaven or real set of pearly gates. 4: Find out if God actually exists. Surely the issue with level crossings is not identifying where they are, but the idiots who choose to drive around the barriers when a train is coming. The only subset of drivers I can see benefiting from this POI set is those who drive across a level crossing without noticing that it's a level crossing. Usually the barriers and warning lights are a big clue. I find it very interesting the difference in cultures between the USA and the UK, usually to the detriment of the USA. However with the railways they have got it right: Darwinism has produced a society with a healthy respect for the railroads. I have never found a level crossing here. At best there are pole barriers, and often just flashing lights. The tracks are not even fenced off you 'could' just walk down the tracks, even in a city. In all the time I have been coming over I have only witnessed one incident and that was a beached low-loader that got stuck on the crossing. The result of this is that the public is not kept away from the tracks and has learnt that railways=danger and treat them as such. Isolating the public and protecting them from the danger removes our survival instinct. Maybe it is time to relax the health and safety regime and re-introduce common sense. Educate rather than wrap up in cotton wool!!! Perhaps if you were in my position & just missed one or two of the morons who jump the barriers whilst doing 80+mph, you might have a change of mind. First one was at Kings Fernsden (Petersfield, Hants), missed one doing 85mph by a matter of feet. Second was at Milford, Surrey (Where that NR film was shot), doing 80 with a fast London, a car driven by a dumbass woman with two kids in the back, went around the barriers, missed them by probably 20m. The British are complacent to say the least, they don't have a clue how fast & how heavy a train is & how far it takes to stop one from 100mph (it's about �mile on a good dry rail & good brake), about 1�miles from 125mph. It maybe time to start being as hard hitting as the Australians are with their rail safety films. Because TBQH this country is run by wooses, who won't do hard hitting films, in fact as a driver I think it's really about time that we started showing the true, uncensored version of what happens to a human when hit by a train, it might just hit home. You may call that sick, I don't! Having killed once & seen the consequences on more than one occasion, over nearly a � century of driving on the mainlines, by showing the true consequences of mucking about on the tracks & level crossings I think it might actually strike home. So in the meantime have a look at these. But be warned you may find them very uncomfortable viewing or upsetting.